Our product range includes a wide range of donracks multi-tier storage racks, donracks metal racks, donracks multi tier rack, donracks storage racks, donracks warehouse rack and donracks metal display racks. Multi-tier Storage Racks offer the ultimate add-on floor and storage space that is much needed for storage houses. This is a complete system that has multiple shelves, racks and is equipped with stairs, floors, lifts, aisles, walkways, etc. More often than not, you will find that the high tired floors are mirror images of the ground level storage system and walkways are fitted to duplicate the aisle between the racks. 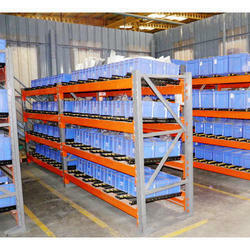 We manufacture and supply a wide range ofMetal Rackto our most valued clients. 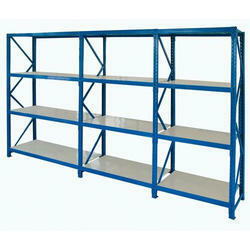 Our offers metal Rack is widely appreciated by our clients which are situated all round the nation. 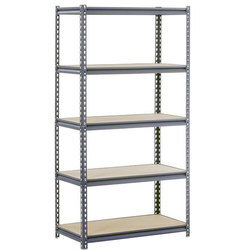 Metal racks are manufactured by using premium quality material and advance technology. Our products are highly admired for their quality and longer life. 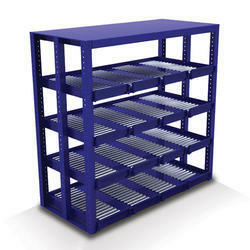 We offer our range of metal rack at most affordable prices. Parts upright poles, stairs, flat plates, checkered plates steel chromium plates, protecting columns etc. We work to please our valuable customers with our excellent quality product range. 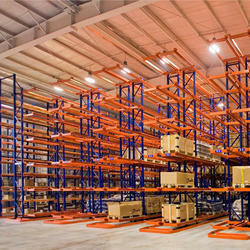 Our offered range ofWarehouse Racksis perfect in dimension and flawlessly finished. Our offered range of product is obtained after the use of superior quality raw material processed in high advanced machinery and equipments. We have given extra fine finishing to our final product range to attain maximum satisfaction of our clients. 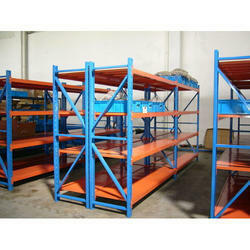 Moreover, our clients can avail this Warehouse Racks from us as per their requirements at industrial leading rates. 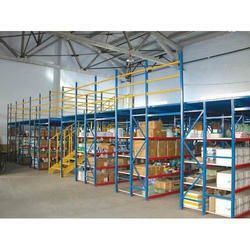 Enriched with vast industrial experience, we are involved in offering a wide range ofStorage Rack. These are widely used by various numbers of clients. our racks are admired for their fine finish and elegance. Besides, these racks are very easy to use and available with us in all standard sizes and designs. 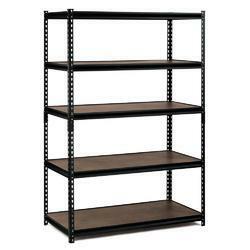 we offer these Racks at feasible prices. We are a trusted company involved in offering the best quality ofMetal Display Rack, which helps to display items systematically in the supermarket. In addition to this, these racks are offered to the clients within the committed period of time. 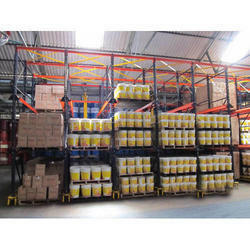 TheHeavy Duty Racksis specially manufactured and supplied for the storage of pallet goods. These are fabricated using premium quality steel procured from the trustworthy vendors. We offer these heavy duty storage racks in customized forms as per the specifications given by our clients. 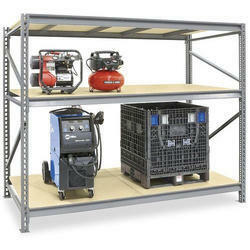 Owing to the varied features listed below, these are widely used in warehouses for storage. Easy assemblage Durability Great strength Quick and easy to install. 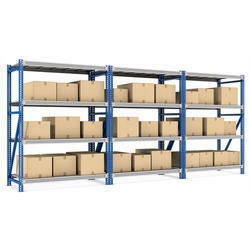 Warehouse Storage Racksoffered by us are used for the heavy-duty storage needs. These are made using high tensile strength steel and have the capacity to store large and bulky items. Our range of Pallet Racks are divided into various shelves and is widely known for the features like the handling of one pallet only without the need to move others, easy stock control and load flexibility. 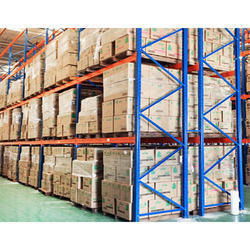 We are well known for the manufacturing ofIndustrial Racking. Matching up with the ever increasing requirements of the customers, our company is engaged in providing Metal Storage Rack. Slotted Angle Racksare ideal for the manual storage of light loads and even moderately heavy ones. The array of Slotted Angle Racks offered by us is available in various tiers, sizes, finishes and thickness, and can be customised according to the client's requirement. Slotted Angle Racks offer very efficient storage solutions for products, material or items and are in huge demand. Our offered Slotted Angle Rack is well acclaimed among the clients for best quality and durability. We fabricate the Indian Slotted Angle Racks in various dimensions and designs and sizes as per the requirement. Slotted Angle Racks are long-lived, robust and hardy in construction and they are economical in space utilisation. we offer them at affordable prices. 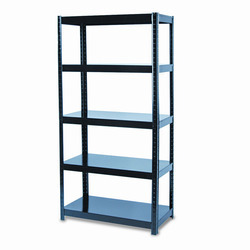 We are the leading manufacturers suppliers and exporter of Electronics Racks. These Racks would serve the purpose only if the displayed items are exhibited properly. Our Electronics Racks are available in different makes and types.These racks are widely demanded for due to hard frame and high load tolerancecapacity. 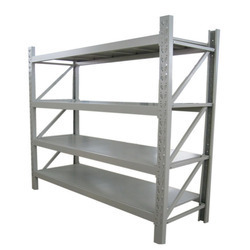 First-in-First-out FIFO Racks are very popular in the manufacturing and supply industry. 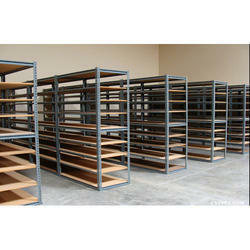 These racks are popularly used in food storage houses, high volume storage units, distribution centers, and warehouses. We offer FIFO Racks system customized to suit the requirement of any business. The components used are made from premier quality steel that adheres to the ISI standards, procured directly from reputed steel manufacturing units. The powder coating is done manually to ensure that there is an even spread enhancing the durability of the product. 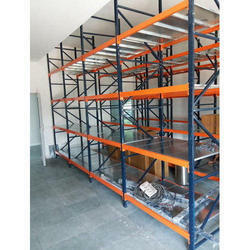 Though the standard width for shelving is 1 meter, long span shelving can also available if need be. 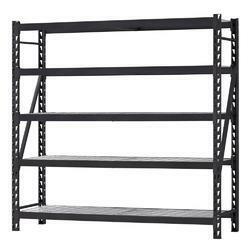 There are many types of shelving on offer that includes. Cantilever shelving - The Cantilever shelving system is well supported on the back and sides offering a clear and easy access from the front. This offers a sturdy alternative and especially used to hold goods of different lengths and is popularly used for light and medium duty loads. It is also available in single and double sided options. It makes the perfect choice for separating smaller loads and loose items. Long Span shelving - Long Span shelving System is a versatile, affordable and optimal solution used for storing long and bulky items. It is used extensively in farms, factories, warehouses, workshops and garages. Slotted Angle Shelving - Slotted angle shelving is a simple and cost effective option that is well suited for any kind of storage requirement. The slotted angle uprights have a unique pre-punched hole pattern that holds bolted multiple steel sections thereby offering a versatile, economic and sturdy shelving system. Gondola Shelving - Pegboard shelving is popularly referred to as Gondola Shelving. Named after the popular boats in Venice, the Gondola shelves, atypical to the low, flat bottomed, both-side entry boats, have a flat bottom shelf and can be used on both sides. It has a solid peg board in the middle with shelves on both sides. It does not have four posts like most types of shelving and is made of steel except for the peg board. Cantilever Racks have become one of the best effective storing solutions in the present day, thanks to its versatility and space-saving usage. Heavy, unrelated bulky items can be sorted according to size and commodity and stored in these racks thereby helping in organizing a manufacturing facility, lumberyard or a warehouse. We offers customized racking solutions for its customers and hence the support arms of these racks can vary in number, capacity and depth depending on the type of load stored. Since the rows are open, it allows easy access and secure load support. There are plenty of advantages that an industrial unit can enjoy when they choose Cantilever racking. Offers Flexibility - Goods can be placed anywhere in the entire stretch of the cantilever rack while still ensuring thereby ensuring easy placement while adhering to the norm of having the right commodity in the right place. Increases Labor Efficiency - In an industrial unit more often than not bulky items are misplaced and not arranged in an orderly fashion. Cantilever racking system will ensure that this is made good thereby saving time and increasing efficiency of labor. Ease of Use - Loading and unloading of goods are relatively easier on the cantilever racking system thereby reducing the handling time of commodities significantly. Versatility - It is possible to store any type of load though popularly it is being used for lengthy, bulky and odd shaped goods. Cost Effective - Effective space utilization and increase in the labor efficiency ensures that this system offers one of the best cost effective racking solutions. Cantilever is especially cost effective in the cases of lengthy goods as any other common racking system's cost can weigh you down. Compact Solution - Without a front column this rack structure saves plenty of horizontal space thereby making it an ideal choice for small-sized storage units. This is the commonly used type where bolted connections secure the arms to the columns. The arm sizes and types used in this type are available as modular constructions. It is easy to install, low on maintenance and can withstand rugged handling. This can be expanded easily as well. This type is best recommended where handling equipment are used. Light Duty Cantilever Racks are economical racks. They are best suited for manual handling situations only. They are sturdy in construction and Don Rack ensures it maintains its structural integrity. The arms can be adjusted to suit the load. Heavy Duty Cantilever Racks are capable of holding heavier goods and the steel beams, arms, and columns are constructed with structural steel. These are particularly popular for goods with low maintenance.